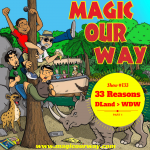 We have Kevin; Danny; Lee, a travel agent with Magical Moments Vacations; and Eli of www.ivorycomcs.com for this episode. 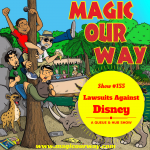 On today’s show, in honor of the start of football season, we have our second annual fantasy theme park draft in which the boys mix fantasy football and their Disney theme park love. 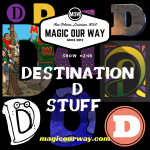 The mission is to create a theme park using elements only found within the four gates of Disney World. The boys have only these slots to fill: 2 E-Ticket rides, 2 dark rides, 2 kiddie rides, 2 show-style attractions, 1 character, 1 restaurant in the parks, 1 restaurant out of the parks, 1 nighttime show, and 1 flex position, which could be anything from the above mentioned categories. The objective is to create your own fantasy theme park, complete with a theme. 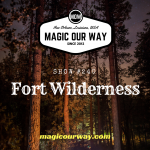 Please let us know who created the best park and share your comments at magicourway@gmail.com.